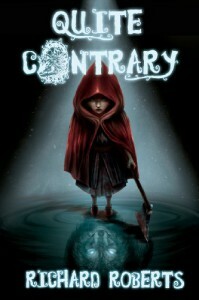 One glance at the cover of Quite Contrary is enough to give you a hint that it's somehow related to a fairy tale of Red Riding Hood. I expected a darker retelling and hoped for some unusual twist. Maybe for the Wolf to be a good guy for a change? But if you start reading Quite Contrary expecting a simply fairy tale retelling you will be very surprised (just like I was), because Richard Roberts did something much better. Richard Roberts merged a lot of known and unknown tales, myths and urban legends into an unique story. Mary Stuart, our heroine, is quite contrary twelve-year-old girl in other words stubborn, pig-headed and usually does opposite of what is good for her. Quite Contrary starts with Mary going to a Halloween party (although her mother forbid her of course) and then Mary accepts a dare to crawl into a underground tunnel in an old deserted house. This will prove to be just the first in a row of 'brilliant' decisions made by Mary. The rest of the teens maybe planned to scare or trap Mary, but Mary keeps stubbornly crawling forward and soon slips from our reality into another dimension and ends up in a forest. By changing from her filthy clothes into Red Riding Hood outfit, Mary triggers that fairy tale and attracts attention of big bad Wolf. *cue in Barry White* I am not joking. With his cheesy lines and deep voice that was how I imagined this 'hairy murderous Casanova' sounded. "That voice wrapped you in honey and velvet, deep and rich and passionate like an old time blues singer's. The body was a wolf's, dirty gray and big. Too big to be a real animal. Dark blue eyes watched me with confident intelligence." Wolf declares his undying love for Mary and desire to nibble on her young flesh (or take a much bigger bite), but 'not in a way that would offend prudish minds'. While Wolf expects from Mary to run (the thrill is in the chase after all) I bet he didn't expect that Mary will run from that fairy tale into another. And that's how constant switches of ambient, characters and never-dropping tension will begin as Mary runs for her own life. If you like to read about paranormal creatures, then Quite Contrary will be a treat for you, because we will visit viking myths, fairyland, city or iron and yellow smoke, hitchhiking urban legends, New Orleans and much more. Although this definitely helped build the dynamics of the story, it was also annoying at times because as soon as I liked the current set of characters, Mary would go to the next story and leave them behind, sometimes even in critical moments. And I wanted to know what happened to them, because I liked them all much more then Mary. Yes you heard me right - I didn't like Mary. I usually do not mind if heroine has issues or if she does not obey the rules, but Mary picked a wrong choice so many times (only because it was contrary to what was told to her to do) that she frustrated and annoyed me from the start. 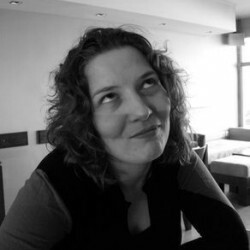 Thankfully, later on, Mary's decision making improves and they shift from unwise to just unconventional. So, if you don't mind reading about 12-year-old girl who has a dirty mouth and attitude problem, and you like dark, gritty fantasy (with no romance) that merges details from other fairy tales and legends into fantastic and sometimes scary original new story, then I recommend you check out Quite Contrary by Richard Roberts.